We collected the majority of metadata history records for Russianschool.es. Russian School has an elaborated description which rather positively influences the efficiency of search engines index and hence improves positions of the domain. The description and keywords of Russianschool were last changed more than a year ago. 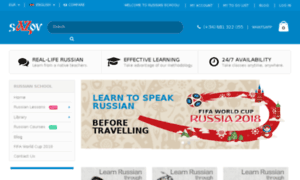 Learn Russian in Online Russian School. Free Russian lessons, videos, tests, Russian courses, audiobooks for learn or teach Russian Language.